When does Raging Waves open in 2019? Raging Waves will be open starting on Saturday, May 25. Please visit our Park Schedule page for a complete calendar. Are there days when Raging Waves will not open due to weather? Yes. Because we are an outdoor park with all water attractions, there are days we might not be able to open for guest comfort or safety. Forecasted high temperatures for our area must generally be at least 72 degrees or warmer. We also take into account cloud cover, wind and potential precipitation on these cool days. We typically make these decisions by 9am and we suggest you checkout our website or call 630-882-6575 for updates on questionable weather days. Yes, we do. The ATM is located just outside the Outback Trading Company gift shop. Please note, this is INSIDE the park gates. You can use your credit or debit card to purchase tickets at our admission booths. Does Raging Waves charge for parking? General and Handicap Parking at Raging Waves is FREE! Preferred parking (which is closer to the entrance gate) is available for $10.00/car. Yes, we take safety . All Raging Waves lifeguards are certified by Ellis and Associates, the leaders in water park safety. Why do the lifeguards perform mock rescues when Raging Waves is open? The lifeguard training provider, Jeff Ellis & Associates (E&A) requires that staff practice Vigilance Awareness Training (VAT) as an educational tool for lifeguards. E&A has long been an innovator in the aquatic community. VAT seeks to educate, train, and prepare lifeguards for a submersion event. Through exhaustive research, the VAT training uses a mannequin to simulate a submerged victim. E&A found that with this training technique, the average detection time was 30 seconds; some detection occurred in as little as 10 seconds. This program is unique in that it involves actually showing lifeguards what a submerged victim looks like. If you see a mannequin in or around Raging Waves, do not remove it. Are there height restrictions for some of the slides? For guests 48″ tall or taller, there are no restrictions (except in areas designed for young children). For those less than 48″ tall there are slide restrictions and the admission price is reduced. Height measurement stations are available at Admissions, Guest Services, In the main Plaza, and at the base of attractions. Please be sure to measure accurately and remember safety first. All policies are at the discretion of Raging Waves management. Boomerang & Wonambi – Must be 48″ or taller to ride. Crocodile Mile – Must be 42″ or taller to ride. Those between 42″ and 48″ must be accompanied by an adult to ride. Cyclone – Must be 48″ or taller to ride. Kangaroo Falls – Must be 36″ or taller to ride lower slides, must be 42″ or taller to ride the upper slides. PJ’s Plummet – Must be 48″ or taller to ride. Platypus Plunge – Must be 48″ or taller to ride. Tasmanian Twisters – Must be 48″ or taller to ride. The Three Sisters – Must be 42″ or taller to ride. Those between 42″ and 48″ must be accompanied by an adult to ride. Wild Wallabies – Must be 42″ or taller to ride. On December 19th 2008 the Virginia Graeme Baker Pool and Spa Safety Act went into effect. This new law requires VGB Compliant Pool Drain Grates. We are VGB Compliant but please note in some applications these grates have a raised profile off the floor as mandated by the Law. Warning: Raised Grate – All of our raised grates have a red circle highlighting their location. They are designed to be stepped on but in shallow water situations they may pose a tripping hazard. May I bring my own life jacket and/or tube into the water park? Outside lifejackets are permitted if they bear the “Coast Guard Approved” tag. We have complimentary life jackets available to use on racks throughout the park on a first-come, first-served basis. Because of the active nature of our attractions, personal flotation devices, including children’s water wings, noodles, tubes are not allowed in the park. All policies are at the discretion of Raging Waves management. Rental Tubes are not permitted in the wave pool between the hours of 12PM-3PM. You are more than welcome to use your rental tubes at Kookaburra Kreek, Three Sisters, or Cyclone during those hours. Tubes are $5 per individual. Does everyone need an admission ticket to enter? Everyone entering Raging Waves must have an admission ticket. We do not offer spectator admission. Do you have a spectator admission ticket? All guests entering the water park must have a regular ticket. There is no way to separate or regulate those who are not using the attractions. Children 2 years old and younger are admitted for free and we offer reduced rates for seniors (ages 62 years old and older). Can my twelve year old (or younger) child be by themselves at Raging Waves? Children 13 years old or older may visit Raging Waves without adult supervision. Children 12 years of age and younger must be accompanied by a responsible adult, 18 years of age or older. Children 12 and under may never be dropped off and left unsupervised. You may leave and re-enter the park as needed. Everyone must get their hand stamped before leaving if they would like to re-enter. In addition to showing the hand stamp, guests must also show their ticket stub from that day or a season pass. Transferring hand stamps is prohibited. Guests will not be allowed to re-enter once the park has been closed. Can I get money back for tickets already purchased if I find a discount offer later? Because Raging Waves occasionally offers extra discounts or purchase incentives throughout the year, pricing is available as is only at the time the order is placed. Pricing adjustments will not be made for previous orders based on past or future promotions or sale prices. All orders are subject to cancellation. I have a ticket from last year, can I use it? All of our tickets have an expiration date. As long as the ticket has not expired, you can use it. All orders are subject to cancellation. If you have a LivingSocial, Groupon, or Travelzoo voucher, please read the voucher to see its terms and conditions. It may have a provision stating that you can receive paid value for that specific offer. That means if you bought a voucher for an Over 48″ ticket, you can use your voucher to receive your paid value off of an Over 48″ ticket. Can I bring food and beverages into Raging Waves? No outside food or beverages are permitted except factory-sealed water bottles (water only– nothing else – ex. Propel, etc…). Unauthorized items will need to be thrown away or returned to your vehicle. Raging Waves will not hold unauthorized items for guests. 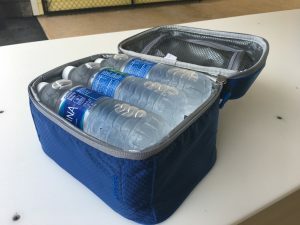 We suggest guests who are bringing food and beverage to keep all items in a cooler in their cars and use provided picnic areas outside the park to enjoy lunch or snacks. No alcoholic beverages may be brought onto Raging Waves property. For the safety of all guests, no knives, glass items (including but not limited to jars, bottles, and mirrors), or other sharp or potentially dangerous items may be brought into Raging Waves and all bags are inspected upon entrance. Grilling is not permitted on Raging Waves property. You may only bring SOFT coolers into the park that are no larger than 8” X 10” x 8”. (Lunch box size as seen below) Lunch box sized coolers can only contain factory sealed bottled water and ice. I have (or a member of my group has) special medical dietary needs. What should I do? Please contact our Director of Operations to make special arrangements at least 24 hours in advance. Due to the numerous fraudulent attempts to circumvent our policies (true example: “My child needs a 24-pack of Mountain Dew with him at all times”), we have instituted this policy to ensure that those with true medical needs can fully enjoy their time at Raging Waves. *Ingredients for Food & Beverage items can be found in the Guest Services Office and at each food venue. What if I don’t want to eat at the restaurants or concession kiosks? Several picnic tables are located in our parking lot, and are available on a first-come, first serve basis. Make sure to get your hand stamped at the entrance upon exiting the park, so you can re-enter when you are finished with your meal. Is the food at Raging Waves expensive? No. Food and beverage prices at Raging Waves are competitive with many popular fast food restaurants. Pizza, hot dogs, and burgers are available—as are healthier choices including fruit and fresh salads. What is the best place and time to eat? Raging Waves offers 2 restaurants and multiple snack carts throughout the park. To beat the crowds we recommend eating around 11:00am or after 1:30pm for lunch and heading to the Hungry Croc for shorter lines and quicker service. Personally, the popcorn chicken with barbecue sauce and a Mountain Dew. Thanks for asking. What items are NOT allowed into Raging Waves? No outside food or beverages are permitted except factory-sealed water bottles (water only– nothing else – ie. Propel, etc…). No alcoholic beverages may be brought onto Raging Waves property. Smoking is not allowed, and this includes cigarettes, cigars, e-cigarettes and other paraphernalia. Grilling is not allowed on Raging Waves property. For the safety of all guests, no knives, firearms, glass items (including but not limited to jars, bottles, and mirrors), or other sharp or potentially dangerous items may be brought into Raging Waves and all bags are inspected upon entrance. Unauthorized items will need to be thrown away or returned to your vehicle. Raging Waves will not hold unauthorized items for guests. Other items not allowed into Raging Waves are chairs, umbrellas, tents, flotation devices, noodles. All photography is limited to friends and family. Any actions deemed inappropriate are cause for immediate ejection without refund. All policies/items are at the discretion of Raging Waves management. Selfie-sticks are not allowed in the park. GoPro (or other) video cameras may not be taken down rides. Outside lifejackets are permitted if they bear the “Coast Guard Approved” tag. We have complimentary life jackets available on racks throughout the park on a first-come, first-served basis. Because of the active nature of our attractions, personal flotation devices, including children’s water wings, noodles, tubes are not allowed in the park. All policies are at the discretion of Raging Waves management. We will suspend the operations of our attractions when unsafe conditions are present (as determined by Management in conjunction with our weather service). We will re-open when weather conditions in our immediate area are safe to do so (we cannot guarantee ideal weather conditions). In the event we cannot re-open our attractions within 60 minutes, guests remaining in the park will receive a complimentary ticket for a return visit to Raging Waves during the 2019 season (you must exchange today’s ticket stub). No refunds are issues regardless of time spent in the park. There are no refunds on incidental expenses (such as Personal Tube Rentals, Lockers, Food, etc.). Refunds and rain checks are not offered. Operating hours and attraction status are subject to change. Does Raging Waves offer rainchecks in case of inclement weather? Raging Waves is open every day of the season, rain or shine but can close for the day based on current poor conditions and a poor forecast. If we experience inclement weather that includes lightning (or some other extreme weather condition), the park will suspend operations until it passes. If the park closes for the day, all customers remaining in the park (except season pass holders) will receive a complimentary return ticket for a visit during the 2019 season. Guests MUST have ticket stub to exchange for complimentary return ticket. Exchange may be done only on the day in which the park closes. Refunds and rain checks are not offered. Yes. Because we are an outdoor park with all water attractions, there are days we might not be able to open for guest comfort or safety. Forecasted high temperatures for our area must generally be at least 72 degrees or warmer. We also taking into account cloud cover, wind and potential precipitation on these cool days. We typically make these decisions by 9am and we suggest you checkout our website or call 630-882-6575 for updates on questionable weather days. What should I wear? Dress code and footwear. Proper swimming attire is required. Any guests wearing clothes that are offensive, such as clothing with profanity will be asked to change. Swim diapers are required for tots. Thong style bikinis are not allowed. T-shirts are allowed on all attractions except speed slides. Cover ups for speed slides are permitted but must be skin tight rash guards. Water shoes are permitted in the Wave Pool, Lazy River, Crocodile Mile, Boomerang, Koala Kove, Quokka-Nut Island and Kangaroo Falls. Water shoes are not permitted on any other attractions. All policies are at the discretion of Raging Waves management. Do I have to rent a tube for rides? Tubes are provided for free on all rides that require a tube. Private individual tubes are available for a daily rental fee of $5.00 and may reduce waiting times at rides, but are not required. Only rental tubes are allowed in the wave pool from 10am-12pm and 3pm-Close. Rentals tubes are allowed in the Lazy River, Wave Pool, Three Sisters and Cyclone all day. Guests must purchase a wristband at a Rentals counter to use rental tubes. Daily individual rental lockers are available for $10.00. Family Lockers are also available for $15.00. We highly recommend use of a locker. I want to make this a special day for my family or group. Do you rent private cabanas? Yes we do. Cabanas overlook the Great Barrier Reef Wave Pool, Kookarburra Kreek Lazy River, Koala Kove, and Quokka-Nut Island. Cabanas are furnished with 5 chairs, a table and 3 lounge chairs. Cabana rentals also include wait staff service and a special snack (wait staff not included with Koala of Quokka Cabanas). Standard Cabanas can accommodate up to 8 guests per cabana. Premium Cabanas can accomdate up to 14 guests per cabana. Each guest will receive a wristband and only guests with wristbands will be allowed into the cabana areas. Make your online reservations early! Reserve your cabana online Cabanas reserved day of are on a first-come basis in person only. No phone reservations will be accepted. No, but we do sell them in the gift shop. Yes, we offer Splash Cash gift cards! Pre-load your funds for the day at Guest Services and use throughout the park at any food kiosk or in the gift shop. Please visit our events calendar for upcoming events. These include Splash Bash (Youth Group Day), Princess Day, Mother’s Appreciation Day and more! How can I hear about special events and discounts? Sign up to begin receiving our e-newsletter (The Wave), for special offers and information on upcoming events by clicking here. Visit our Events page by clicking here. You can also follow us on Facebook and Twitter. What is Raging Waves smoking policy? Raging Waves is a smoke free facility. A reserved smoking area is available outside the park in the main parking lot, by the flag pole. This includes cigarettes and e-cigarettes. We know that when visiting the waterpark you might be concerned about getting separated during the excitement of your visit. It is important that each family or group establish a meeting point for family and friends. We recommend an area outside of the main plaza at specific times throughout the day to check up on all group members. Raging Waves does not page for lost guests but any of our team members and Guest Services is always happy to assist you. I am traveling with my pet. Can I bring them into the park with me? Although we can’t invite your furry friend to join us at Raging Waves, we can direct you to a nearby kennel. Country Comfort Boarding and Grooming, Inc., in Yorkville is a licensed kennel and the closest one to the water park. Contact them at 630-553-9432 for hours, pricing, and other information. Directions from Raging Waves to Country Comfort Boarding and Grooming, Inc.